It seems like Fujifilm is never getting tired to impress us. After releasing the notable X-A2 some time ago, now the Japanese camera manufacturer is rumored to launch its newest Fujifilm X-A3. 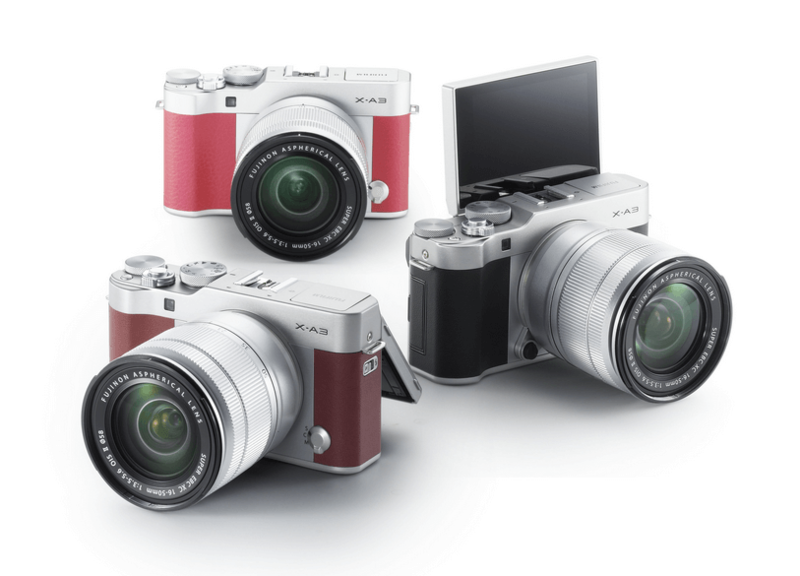 As the successor of X-A2, this compact mirrorless interchangeable-lens camera is also classified in the entry level camera. Matter of fact, this “entry level” label seems makes no sense since this camera product is in fact, amazing, especially when it has obtained the ISO 200-6400 standard that is expandable to 100-25.600. And beyond that labeling, we’re still wondering how the manufacturer could fit those sophisticated features in such a low price. This is a selfie cam. That’s what Fujifilm has stated since the first time of its release. So as the selfie camera, Fujifilm X-A3 brings a lot of supportive features for selfie people, especially on the design. Fuji seems to realize it so much that most of the selfie people are aware with aesthetical value. That’s why the manufacturer brings a super delighted design on X-A3. The camera comes in retro, with the compact and lightweight body covered in the faux-leather as the complement. Paired with the aluminum accents on the top cover, top dials, and front plate, this camera shines brighter under the name of fashion. Then, nothing more emphasizes the selfie identity than the touchscreen LCD it has. The LCD here is quite unique, enabling 180 degree articulation. This is why selfie will always be easy with this whole-fashioned digicam. However, you still able to command the dials that located on the back of the camera while checking the selfie result on the front forward articulated LCD screen. Moreover, the presence of several features such as Touch AF, Touch Zoom, and Touch AF will also maximize the functionality of the articulating LCD it has. As the successor of X-A2, the company has made so many upgrades in this edition of Fujifilm X-A3, especially on the specifications. Just take a look at the increasing resolution sensor from 16.3 to 24.2 megapixels APS-C sensor. This is the trending sensors that is used by most of the high class camera in the market. Further, the video recording capability is also increased from the 1080/30p to the 1080/60p, makes us see quite significant different in here. The presence of panorama and time-lapse feature will also surprise you with what this camera could ever does. In addition to that, you will also get better autofocus for a better photography result. Talking about interchangeable-lens camera, we can’t avoid the talk about its lens. And here, Fujifilm has prepared everything so well. It is proven with the release of Fujini XF 23mm f/2 R WR. This is the kind of lens that is planned to be matched with all future Fujifilm cameras. This lens is rugged and small, but already completed with weather, dust, freeze, and water-resistance capability. Further, the metal housing of the lens is also reflecting the classy futuristic look. While in the inside it, you will be able to find 9-blade aperture and 10 elements in 6 groups. All of these lens parts can be controlled through the aperture rings that located in the outside of the lens. With the high level of specification above, the lens is claimed to be able to reach 0.05 seconds speed focus. This state can be achieved when user use the phase detect in the X-T2 and X-Pro2 system. What a sophisticated and advance capability for a competitive-price lens, right? And if you are interested to this lens, pre-order is the best way to take since it will be released in September this year. And talking about price, all of the features of this lens will be covered in 450 USD of price. It is already stated before that Fuji has tagged this high quality camera in such a competitive price. But, what we emphasize here is that “competitive price” doesn’t always mean a regular, or bad in term of quality. This camera is the prove of it. With the presence of sophisticated photography features and better connectivity (it comes with Wi-Fi actually), the whole package of this camera is only tagged with such a low price. So, for you who want to own this camera, you should wait at least for a couple months later. It is due to Fuji plan to release Fujifilm X-A3 sometime in October. And the low price we’re talking about her, Fuji defined it as 600 USD.